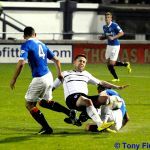 Raith were soundly beaten by a dominant Rangers side, losing by four goals to nil on an evening where a more resounding defeat looked likely during a one-sided second-half. Goalkeeper Ross Laidlaw was awarded Man-of-the-Match following several excellent saves which only served to emphasise the quality of the visitors’ performance. While Raith can take few positives from the game, Rangers sent a warning to the Championship that, following several hesitant victories in the early weeks of the campaign, there was an intensity and drive in the visitors’ play that a watching Heart’s coach Robbie Neilson would have noted for later in the campaign. Grant Murray’s team selection could hardly have been improved. Denied the muscular presence of Christian Nadé and the experience of shot-stopper Kevin Cuthbert, Lewis Vaughan was given a start playing just behind Mark Stewart, with Laidlaw the natural replacement for Cuthbert in goal. Watson and Perry began at centre-half, with Fox and Moon attempting to disrupt the visitors’ expected flow through midfield. Notable from the off was the similarities in formation all across the field. Kevin Moon and Liam Fox were matched up directly with Nicky Law and Ian Black, while both teams fielded a front two with supporting wide midfield players. While Rangers could be expected perhaps to enjoy the bulk of possession, it was surprising that their formation engaged Raith directly in every aspect of play. Additionally, Rangers’ tempo was high from the outset. The intensity with which Rangers chased and closed their counterparts down reduced the quality of Raith’s possession noticeably. While against some Championship sides, Watson and Perry have been able to build from the back with Fox dropping deep to pick a pass, the home side had no time to establish a foothold in their own defensive third. 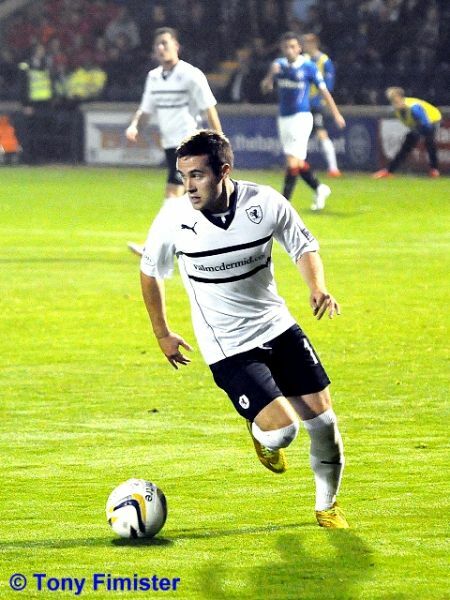 Raith’s passing from deep was hurried and often inaccurate, allowing Rangers to drive forward from the central third deep into Raith territory. Having said all that, Raith started well. Thomson tracked a Clark run and matched the Rangers’ frontman for pace, Watson’s first aerial battles with Mohsni were won, and Vaughan cheekily nutmegged Black before setting off for goal. 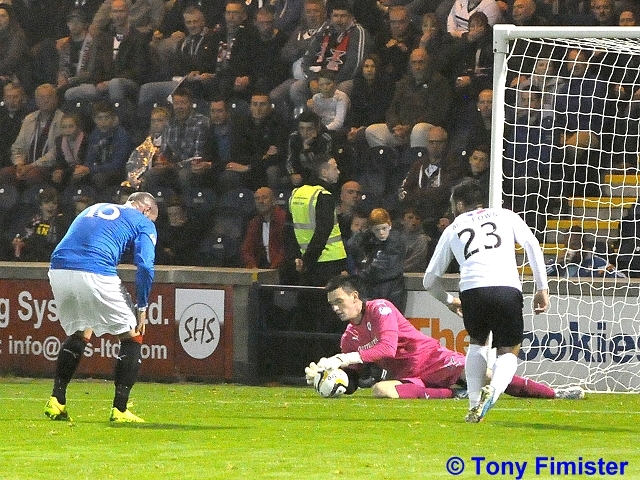 Conroy’s floated free-kick forced Simonsen into a double-save with first Stewart then Watson making contact. Moon, Fox, and Stewart won several skirmishes in central areas. Rangers had their moments in the first ten minutes – Black shooting high over Laidlaw’s bar, and Law extending McKeown to cross into the danger area. The game had started in rumbustious fashion – both sets of supporters vocal in their support, the ball crackling cross the damp turf, and the visiting live television cameras picking up every thrust and counter-thrust. 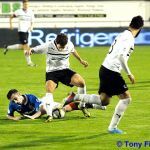 The Friday evening kick-off may have been unfamiliar for some – the opening stages felt more like a mid-week cup-tie than a league encounter. Grant Murray would have instilled into his side the need to keep a defensive line early on, and to shackle the visitors’ front-men, hoping to frustrate as much as create. With 15 minutes gone, Rangers led with a deceptively simple goal. Aird’s 25-yard shot had already stun Laidlaw’s palms and Boyd flagged narrowly offside, before a whipped cross from Aird found Clark a step ahead of Watson, his angled header across Laidlaw opening the scoring. Watson and Perry for the first time had let their marking slip, with the pace on the cross key in allowing Clark to glance his flick beyond Laidlaw’s outstretched right hand. The loss of an early goal prompted a response of sorts from Raith, but the atmosphere around Starks Park had quietened. While Stewart and Vaughan chased for through balls and flicks, Mohsni and McCulloch seemed comfortable in retaking possession and springing full-backs. Wallace and McGregor were able to skim forward adding options for Law and Black in midfield. Boyd and Clark upfront were served numerous opportunities to turn and create openings. Following the Rangers opener, Wallace cut inside for two goal-bound efforts, Boyd narrowly failed to connect with another through-ball with a shot on goal seemingly inevitable, and Wallace collected Boyd’s intelligent invitation to fire just wide from outside the area. With Raith struggling to gain any traction in the central third, it was no surprise referee Colvin drew the ire of the home fans. While some decisions prompted howls of protest from the home fans, in truth the complaints couldn’t mask a frustration with the visitors’ superiority in and out of possession. Following Thomson’s game battle with Wallace down Raith’s right-hand side, the home defence momentarily lost concentration – MacLeod’s delicate chip nearly catching Laidlaw two steps off his line, the Raith keeper recovering his ground to flap clear. 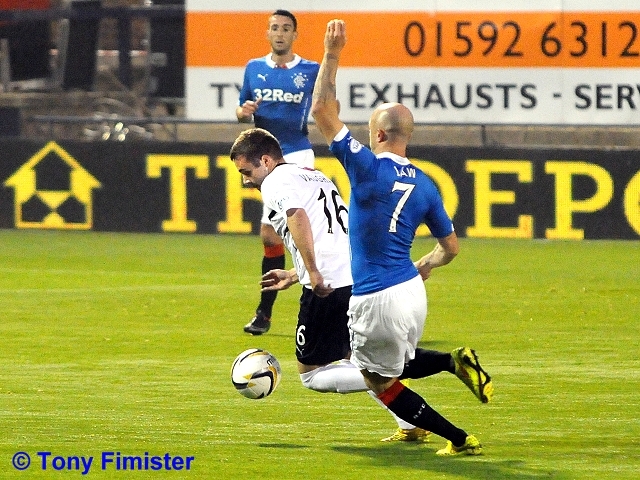 The dominant tactical element of the first half – Rangers’ Wallace firing down his flank with MacLeod ahead of him cutting inside – led to the second goal. 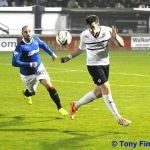 While Thomson did well to subdue another surge from Wallace, his clearance went straight to Boyd, who in turn fed Black. With time and space to set himself, Black’s central drive deflected horribly off Watson, looping up and over Laidlaw. Within moments, it was three. Unforgivably, Raith conceded possession almost directly from kick-off. The irresistible swarm of Rangers’ attackers gathering the ball, Law curling home a drive from 20 yards. 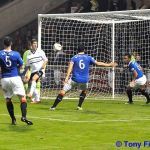 While the finish was admirable, home supporters despaired at the ease with which Rangers had been able to seize possession, and effectively finish the game as a contest before half-time. Before referee Colvin offered the sanctuary of half-time to the home side, Boyd had a drive deflected wide, Aird sent an arrow zipping across Laidlaw’s goal, and Clark gave Perry the slip to fire another cross goal-bound. 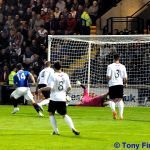 While home fans began the game harbouring thoughts of a tenacious draw or unlikely victory, half-time allowed fans to ponder the similarities with the recent home defeat to Hearts – despite no lack of endeavour, there appeared plenty between the sides. With Rangers’ preparation and full-time status, the physical gap between the sides would only broaden in the second half. Raith were out for the second half early. 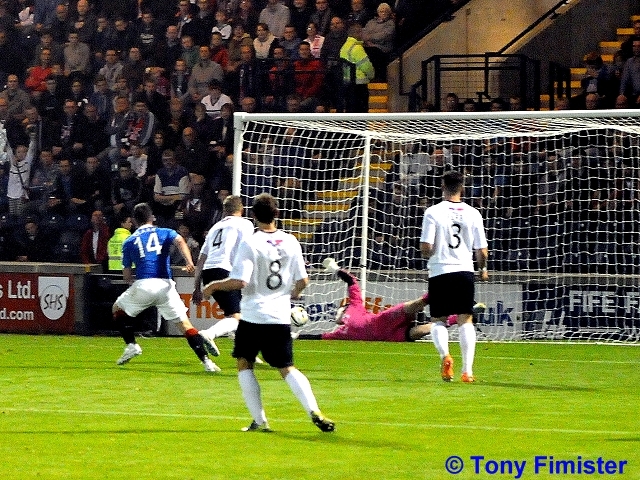 Vaughan and Stewart drove early at the heart of the Rangers’ defence – from Stewart’s chip, Scott’s header was collected by Simonsen. 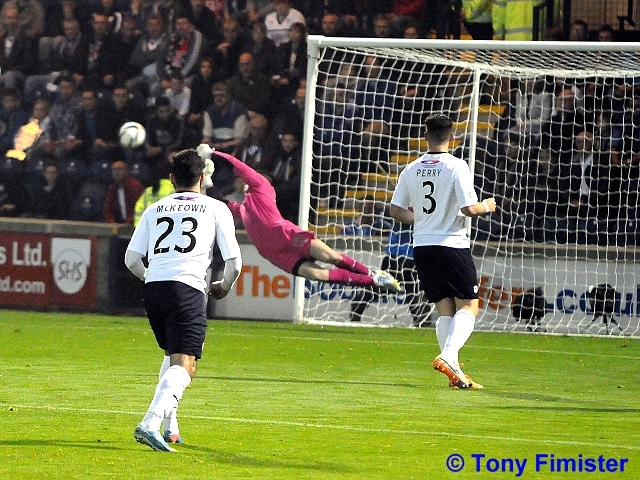 It was to be Raith’s penultimate effort on goal, a final header drifting beyond Simonsen’s post deep into injury time. For much of the second-half, Rangers’ ease of control belied a vigour about their midfield arguably missing from their early season encounters. Nicky Law – author of the one moment of genuine skill in last season’s Ramsdens’ Cup final with a waist-high volley which thumped the junction of post and bar – was particularly influential. Bringing in Wallace to his left and McGregor and Aird to his right, Law’s willingness to cover ground allowed Clark to make instinctive runs with Boyd his foil. Wallace fired an angled drive just over, Boyd again was denied by a fine Laidlaw dash from his line, and the same player fired just wide when clean through. 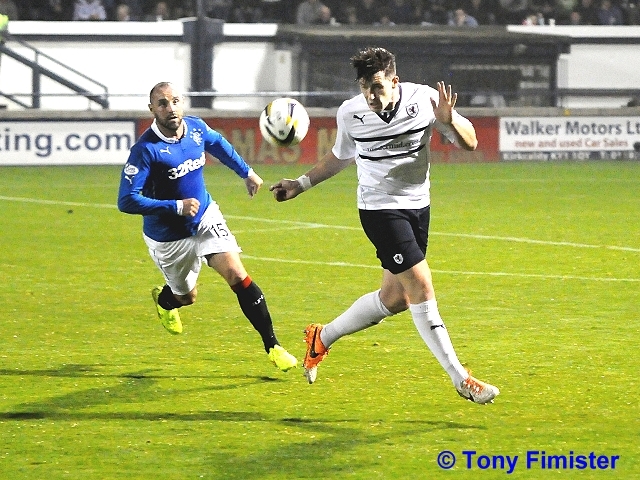 Raith’s front-two got no change from McCulloch and Mohsni. Stewart unluckily turned an ankle shortly after half-time and wasn’t able to regain his sharpness in the remainder of the ninety minutes. Vaughan, while alert and mobile, was closed quickly and constantly found himself outnumbered or too distant from supporting midfielders to retain possession. The visitors’ fitness told in the closing stages. 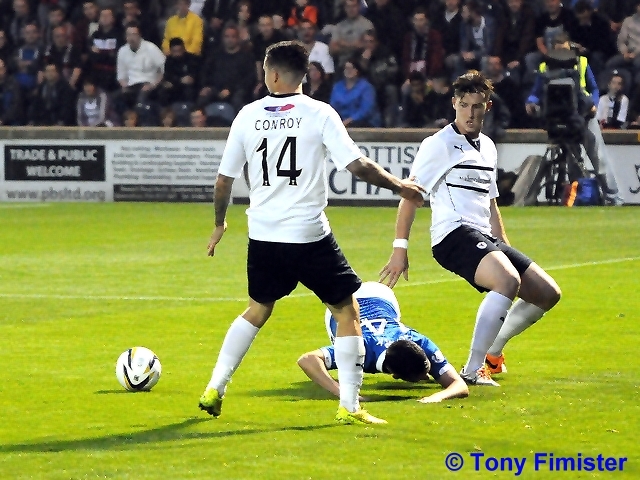 The introduction of Grant Anderson and Calum Elliot failed to re-energise the Raith midfield. If anything, Rangers’ introduction of Templeton, Shiels, and Daly caused more worries to the Raith rear-guard. 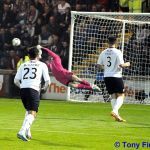 Boyd had been withdrawn by this stage, having lost his personal battle with Raith keeper Laidlaw. 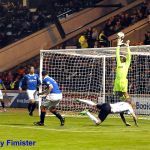 Laidlaw made several fine saves – one particular block low-down to his right-hand-side had the Rangers’ striker holding his head in disbelief – which no doubt kept Raith from conceding further goals. Rangers’ increase in tempo with the introduction of three attack-minded substitutes brought a fourth goal. With Wallace released into the area, he cut across a retreating Grant Anderson and went down under contact. 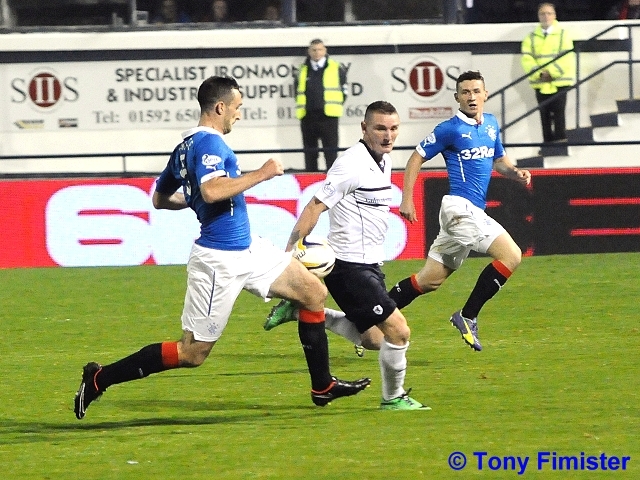 McCulloch dispatched the spot-kick. 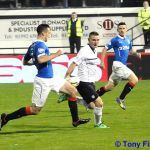 Mark Stewart’s evening was typified with ten minutes to go – chasing a long through ball with Vaughan, the pair exchanged neat flicks before Stewart was flattened by an uncompromising challenge from McGregor. 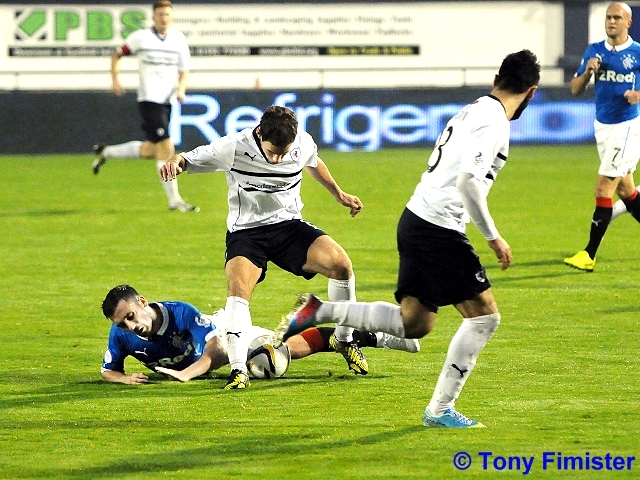 The tackle left the Raith striker groggy, looking to the bench for inspiration. 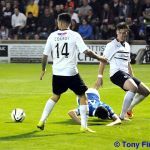 The closing stages conveyed the same message as much of the earlier play – the visitors, with options and pace down both flanks, were able to stretch and turn Raith regularly in the second half. Incisive through-balls found space behind Thomson and McKeown on the flanks, offering service for Clark, Boyd, and others joining from deeper areas. 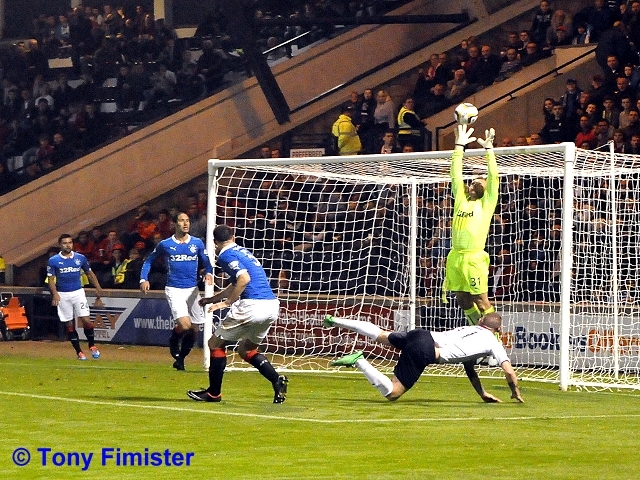 As Laidlaw was announced as the sponsors’ man-of-the-match to the 6,250 crowd, he saved again at the feet of Templeton. 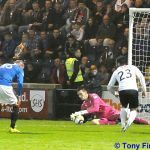 Home fans streamed out of Starks Park well before referee Colvin brought matters to a close following two minutes of extra-time. With injured front-man Kenny Millar present only in a television capacity, and Rangers generating an extra surge with three attacking substitutes, the quality outwith the visitors’ starting eleven was there for all to see. While for Raith – as will be the case for other Championship sides this season – the task is to convert the gloomy aftermath of this sobering defeat into a positive run of future results, the victors stamped their authority on the league as one of the two main contenders. For the Starks Park staff and supporters alike, the next game cannot come quickly enough. Welcome to Starks Park, BBC's Chick Young's talk of the sea haar is unfounded, visibility is excellent. Tonight is the first of two Friday night matches on TV, it was announced today that our tie against QotS is on BBC Alba. 5 minutes to go and the stadium is filling up. Rangers kick off towards the South Stand. Conroy with a free kick, Simonsen is forced into a double save. Simonsen in action again, this time Stewart causing trouble. Black from distance sends the ball high over the bar. Law almost through, McKeowan to the rescue. Laidlaw skins Clark then sends the ball clear. Stewart beats McGregor to the touchline, his cross is intercepted by Simonsen. Aird shoots from 25 yards, Laidlaw parries the ball out for a throw. Boyd thought he had an opportunity but is judged offside. Nicky Clark with a free header scores from 6 yards. Clark comes off second best in a challenge with Laidlaw. Wallace whips in a ball but Boyd can only shake his head as it is deflected for Laidlaw to gather. Wallace cuts in a shoots over the bar. Wallace forcing Laidlaw to turn the ball round the post for a corner. From the corner Boyd is penalised for a shove on Watson. Law whips in a cross, Boyd again penalised for a knock on Watson. Black with a deflected shot sent the ball over the head of Laidlaw. Law in plenty of space hits the net. Aird's shot whistles past Laidlaw's post. Stewart crosses but Jimmy Scott could only get a tame header which was picked up by Simonsen. Boyd through on his own sees his shot fly across the face of goal. 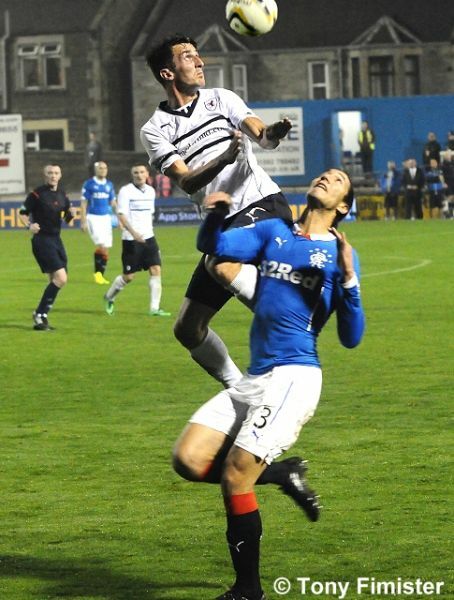 Mohsni unhappy being dispossessed by Stewart. Laidlaw reacted well to save poin blank from Boyd. Stewart goes on a run and is intercepted by Wallace. Laidlaw again, saves from Clark. Rovers starting to get back in th game. The ball is in the Rovers net, however Clark is penalised for fouling Laidlaw. From a corner McGregor hooks the ball way past the right hand post of Laidlaw. Laidlaw rushes out of his area to clear from the feet of Boyd. 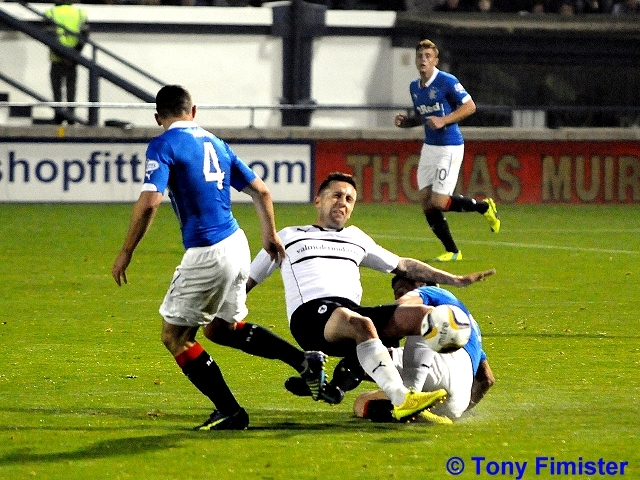 Stewart is taking a bit of punishment from Rangers defenders. Penalty, Black shoots low to his left and beats the outstretched Laidlaw. Boyd clean through sees his front post shot go wide. Vaughan off, Elliot on. MacLeod and Boyd off, Shiels and Daly on. Shiels shoots low from the edge of the area, Laidlaw had the effort covered. Wallace in acres of space launches the ball high and into the crowd. Anderson with a brilliant cross watches as Scott can only head past the post. Laidlaw, Thomson, Perry, Watson, Fox, Moon, Stewart, Scott, Conroy, Vaughan, McKeowan. Subs, Anderson, Elliot, Callachan, Ellis, Robertson, Bates, McGurn. Simonsen, McGregor, Mohsni, Aird, Wallace, McCulloch, Law, Black, MacLeod, Clark, Boyd. Templeton, Smith, Shiels, Zaliukas, Daly, Perelta, Robinson.